Public Service Announcements Sign up for notifications of any emergency situation, mosquito spraying or any event that would directly effect our citizens. A Community Submitted Events Calendar This calendar is open for the community to submit your event and have it posted on our website. Please note submissions may take up to 24 hours for approval. Board of Public Affairs The Board of Public Affairs presides over the Water and Sewer Department. This calendar will notify you of their meeting dates and times. Brush Pick Up The Village offers this service on the 2nd Monday of each month, January through October. Brush MUST BE at the curb by 8 am. Crew will only go through each neighborhood 1 time per month. Curbside Recycling Curbside recycling is offered to Village residents by our contracted trash hauler Republic Waste. They can be reached at 1-800-247-3644 with any questions regarding this service. Economic Development This calendar will notify you of the Economic Development Committee meetings. Library This calendar is updated by the Doylestown Library with special events and programs that they offer. Mayor's Court This calendar is maintained by the Mayor's Court Clerk and will show dates and times of our Doylestown Mayor's Court schedule. Parks & Recreation This calendar will show Park Board meetings dates and times. 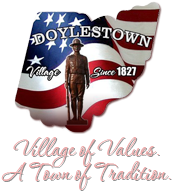 Police Department This calendar will show any special events hosted by the Doylestown Police Department. Summer Recreation Events This calendar will show the schedule of our Summer Recreation program. Trash/Recycling Holiday Delay This calendar will notify you of any scheduled trash and/or recycling delays. Delays happen if a holiday falls between Monday and Friday. The delay will then fall on Saturday. Village Council This calendar will notify you of any Village Council meeting date and time. Village Hall Holiday Closures This calendar will notify you of any scheduled Village Hall closure. Village Misc This calendar will display Village sponsored events around the community.